In the early 1990s, there was a real push to reduce the prescribing costs of inhaled steroids, an essential component of asthma management, in the UK. Professor David Price was then working as a principal in general practice in Thorpewood Surgery, a busy primary care centre in Norwich. The centre was one of the first to adopt asthma clinics, inspired by an early publication authored by Ian Charlston and published in the late 1980s. As a result, prescribing costs for inhaled steroids were one of the highest in the area. Professor Price was asked to reduce the costs of his inhaled steroids – an almost impossible feat at the time. 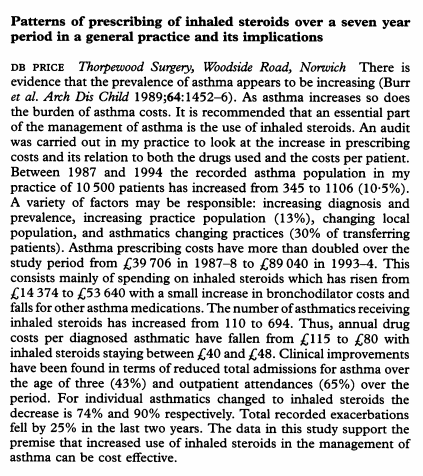 Despite this, Professor Price was able to show in a real life study that within a period of seven years, a tenth of the admissions of asthma patients as compared to neighbouring practices incurred less costs overall, despite an increase in the prescription of inhaled steroids. This effectively showed that increased used of inhaled steroids in the management of asthma can be cost effective. This novel finding was first presented at the British Thoracic Society (BTS) meeting in 1994. Today, evidence-based guidelines for asthma such as those published by the National Institute for Health and Care Excellence (NICE) and Global Initiative for Asthma (GINA) recommend inhaled steroids in favour of asthma therapists. This study was one of the first to demonstrate the importance of real world evidence and its applicability to real life clinical practice, spurring Professor Price to found the Observational and Pragmatic Research Institute (formerly known as Research in Real Life) to further the important field of real life research. Today, OPRI has over a decade of experience and internationally-recognised experts under its wing to meet the growing demand for real world evidence by providing real life research solutions in the form of high quality observational studies and pragmatic clinical trials.